It was stunning, gorgeous! 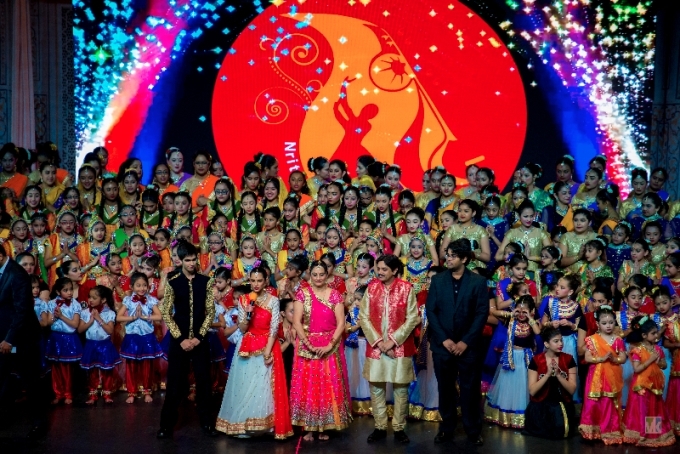 Nritya Natya Kala Bharti (NNKB) put on another truly spectacular show with their 2017 Annual Concert on March 26 at the Georgia World Congress Center’s beautiful Sidney Marcus Auditorium. The audience of the nearly sold out event was treated to an evening of Kathak dance, followed by a Bollywood extravaganza. “Ritu Utsav: A Festival of Seasons” was the Kathak segment. The talented students performed various pieces signifying the close relationship of seasons and their respective festivals to not just Indian culture, but to Indian classical dance. Groups showcased specific seasons, such as, Hemant, Grishma, and Varsha Ritu, along with festivals of Shivratri, Ganesh Chaturti, and Janmashtami. Music Director Sandeep Savla captivated the audience with his melodious voice and brilliant music composition alongside his exquisite team of singers including Sandeep Kowtha, Madhuri Haritwal, Geetu Venugopal, Sarayu Narayan, and Janhavi Telang. Dance Director and Guru Kumud Savla’s vision of advancing the Indian classical arts has been visible in the caliber of her shows year after year. Her classical fusion duet with Irish dancer Dylan Radford was one of the highlights of this segment. Dylan’s intricate, quick, and precise movements on his feet combined with the brisk footwork, circles, and expressions of Director Savla showed a perfect combination between East and West, a union of culture from two continents. The segment ended with a ceremony celebrating the Visharad Graduating class of 2016, honoring them for completing a rigorous degree program in Kathak dance through NNKB’s affiliation with Gandharva Mahavidyalaya. The evening concluded with the Bollywood segment. Beginning with a breathtaking choreography to Mohenjo Daro, it became a fast paced ride with foot tapping music, colorful costumes, and energetic dances from bhangra to Latin-Bollywood fusion. The youngest performers were adorable and danced to the latest Bollywood hits like “Cham Cham,” “Love You Zindagi,” among others. The “Blast from the Past” piece starring the advanced students and Sil Savla had the entire audience clapping to the evergreen twist hits of Bollywood, such as “Aao Twist Karein” and “Aaj Kal Tere Mere Pyaar.” With her nimble yet powerful and smooth flowing movements, Assistant Director and choreographer Samta Savla gave a mesmerizing performance to “Mohe Rang Do Laal” as she and senior-level performers enticed the audience with pure grace and skill. The vibrant costumes accompanied exquisite lighting, and multimedia presentation on the LED video wall showcased a sophisticated production and served as visual treat for the audience. The NNKB team of Directors Kumud and Sandeep Savla, Samta Savla, Mital Patel, Brittny Chandra, Manjula Devi, and Vasanta Chivukula put on a truly wonderful community event, once again advancing Indian arts and culture in America!